A material's density is defined as its mass per unit volume. Put another way, density is the ratio between mass and volume or mass per unit volume. It is a measure of how much stuff an object has in a unit volume (cubic meter or cubic centimeter). Density is essentially a measurement of how tightly matter is crammed together. The principle of density was discovered by the Greek scientist Archimedes, but it is easy to calculate if you know the formula and understand its related units. The SI unit of density is kilogram per cubic meter (kg/m3). It is also frequently represented in the cgs unit of grams per cubic centimeter (g/cm3). In studying density, it can be helpful to work a sample problem using the formula for density, as mentioned in the previous section. Recall that though density is, indeed, mass divided by volume, it is often measured in units of grams per cubic centimeter because grams represent a standard weight, while cubic centimeters represent the volume of the object. Thus, the density of the salt brick is 2.165 g/ cm^3. One of the most common uses of density is in how different materials interact when mixed together. Wood floats in water because it has a lower density, while an anchor sinks because the metal has a higher density. Helium balloons float because the density of the helium is lower than the density of the air. When your automotive service station tests various liquids, like transmission fluid, it will pour some of the fluid into a hydrometer. The hydrometer has several calibrated objects, some of which float in the liquid. By observing which of the objects float, the service station employees can determine the density of the liquid. In the case of the transmission fluid, this test reveals whether service station employees need to replace it immediately, or whether the fluid still has some life in it. 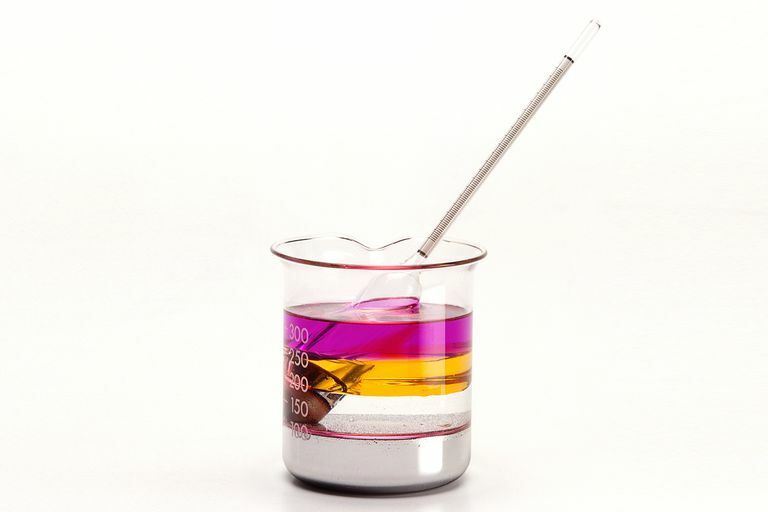 The change in density can also be useful in analyzing some situations, such as whenever a chemical conversion is taking place and energy is being released. The charge in a storage battery, for example, is an acidic solution. As the battery discharges electricity, the acid combines with the lead in the battery to form a new chemical, which results in a decrease in the density of the solution. This density can be measured to determine the battery's level of remaining charge. Density is a key concept in analyzing how materials interact in fluid mechanics, weather, geology, material sciences, engineering, and other fields of physics. A concept related to density is the specific gravity (or, even more appropriate, relative density) of a material, which is the ratio of the material's density to the density of water. An object with a specific gravity less than one will float in water, while a specific gravity greater than one means it will sink. It is this principle that allows, for example, a balloon filled with hot air to float in relation to the rest of the air.